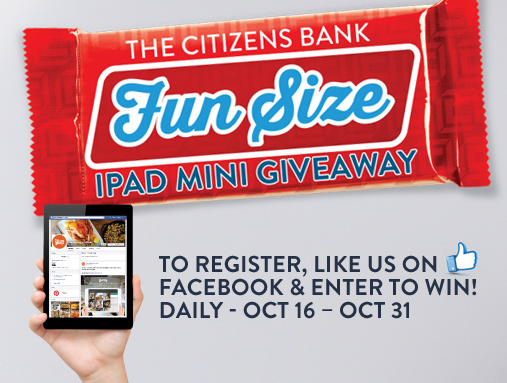 ENTER CITIZENS iPAD MINI DRAWING & WIN BIG! Visit and like us on Facebook to register to win an iPad Mini 7.9-inch tablet with Wi-Fi that fits big advantages into your day. Photos, videos and web sites look great on the brilliant display and getting things done looks easy banking right on your iPad Mini. Just as our Online Banking will soon pack a powerful punch in a small package, the iPad Mini is perfectly sized for everything you love to do. We will be drawing for two iPad Mini tablets on Halloween, Oct. 31. • From October 16th to October 31st, you can register directly on our Facebook page for a chance to win (each Facebook profile can enter once per day) one of two iPad Mini tablets. Following the end of the giveaway (5 pm CST on October 31), the two winners will be selected at random and will receive an iPad Mini 7.9-inch tablet. • No purchase, banking relationship of any kind or payment of any kind necessary to enter or win this contest. Void in Puerto Rico, U.S. Virgin Islands, U.S. territories and possessions and where prohibited or restricted by law. • Eligibility: The 2014 Citizens Fun Size Giveaway is open only to legal residents of one of the 50 states of the United States or the District of Columbia who are 18 years of age or older at time of entry. (Proof of residency and age may be required.) Officers, directors, and employees (collectively, “employees”) of The Citizens Bank, and any members of their household or immediate family (defined as parents, spouse, children, siblings, grandparents) of such employees, and all those with whom such employees are domiciled are not eligible to enter or win. • Entry Period: The 2014 Citizens Fun Size Giveaway begins October 16, 2014 at 8 am CST. The giveaway entry period concludes on October 31, 2014 at 5 pm CST. • How To Enter: During the Entry Period, you can enter the Contest by visiting The Citizens Bank Facebook page. You will need to be a member of Facebook (becoming a Facebook member is free) and you will need to “like” The Citizens Bank Page in order to participate in the Contest. Once you “like” the Page in order to participate, you can register. You are allowed “one entry” per Facebook Profile “per day”. You will also receive “five bonus entries” for each giveaway entry made by one of your Facebook friends. • Contest Restrictions: Limit one (1) Winner per person and per Facebook account/email address.• Winner Notification: Within 48 hours of the conclusion of the giveaway, the two winners will be selected at random and notified by phone or email.• General Conditions: By participating, participant agrees to be contacted by The Citizens Bank by email and telephone and that if participant is a giveaway winner, The Citizens Bank may use participant’s user name and biographical information (city and state) on The Citizens Bank Facebook page and web site in an announcement of the winner and prize. • Personal Information: We use personal information collected in our giveaways and contests to contact the winners. We may also use such personal information to send you information electronically about us and our products and services, but we will provide you with an opportunity to opt-out of receiving this information at any time after you first receive such information from us. We do not share or sell information about individuals who enter our giveaways and contests other than to contact a winner and arrange for fulfillment of a prize. • Dispute Resolution: Any and all disputes with respect to this Giveaway will be resolved in the appropriate courts in the state of Mississippi exclusively, and subject to the laws of the State of Mississippi. • The Contest is not sponsored, endorsed, administered by or associated with Facebook.